The Saxon hotel is an exclusive retreat with an award-winning spa and elegant dining. 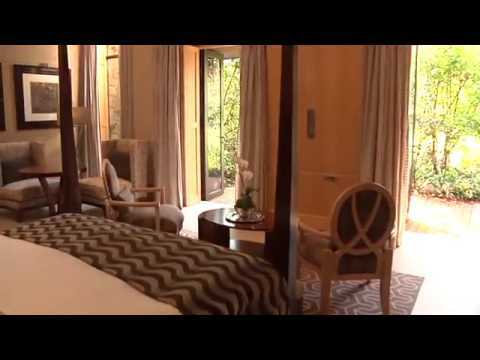 The Saxon Hotel, Villas & Spa is a luxurious oasis on ten landscaped acres in Johannesburg’s neighborhood of Sandhurst, known for its quiet tree-lined avenues. Its proximity to Sandton makes it ideal for business travelers, but it is equally favored by those en route to safari destinations. Johannesburgers know The Saxon as an exclusive retreat with an award-winning spa and elegant dining in the restaurant or more intimate wine cellars. The suite and villa accommodations evoke a sense of calm and measure 860 square feet and up, with many overlooking the massive pool. Perhaps the hotel’s proudest boast, however, is that the former South African president and Nobel Prize-winner Nelson Mandela chose the Saxon as his sanctuary in which to complete his autobiography, Long Walk to Freedom. Qunu extends a warm African welcome, enticing you with its rich surroundings, red tones, woven lampshades and an ambient glow. The Saxon Hotel prides itself on its vast collection of African art, ranging from pencil sketches to sculptures and paintings. The Saxon Spa is a retreat for peace and harmony that embodies a holistic way of life. 35km from Johannesburg International Airport. 5km from the Sandton Gautrain Station.